South Shields's only iBeani stockists with a variety of designs for all. The iBeani tablet bean bag stand was designed and created after stumbling across a problem, our tablet devices just don’t balance, resulting in us having to hold them with one hand and navigate or type with the other. Having looked at other tablet stands on the market, nothing seemed to quite match the needs of the public or hold the tablet just right when on the lap, compared to the sofa arm, for example, and thus the iBeani tablet stand was born. 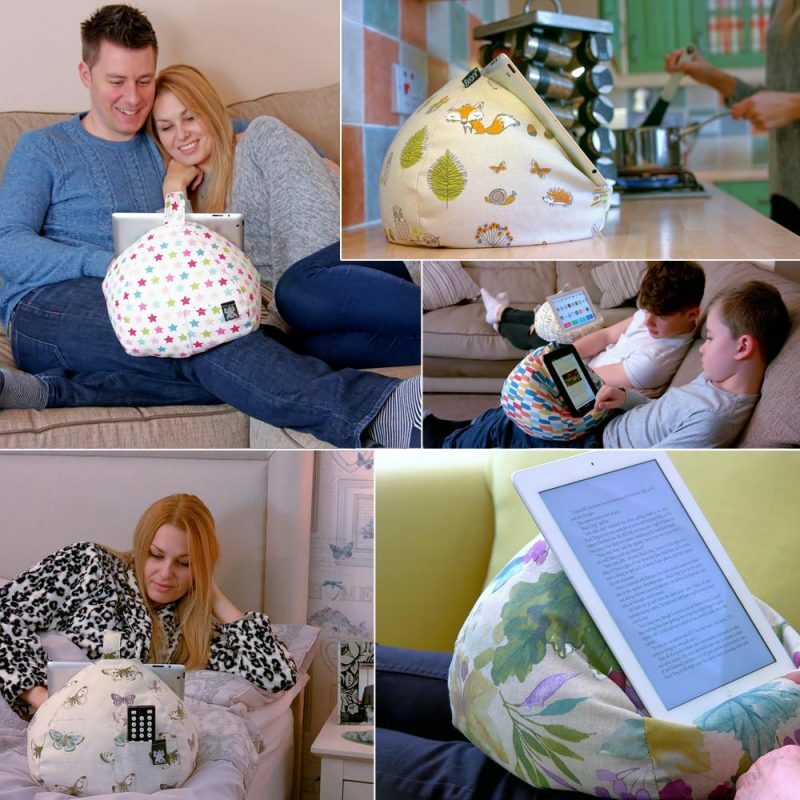 After months of research, head scratching and prototypes, the iBeani tablet bean bag was created. An iBeani tablet bean bag is designed to sit on any surface, holding your tablet device at any viewing angle, securely, so you don’t have to, freeing both hands. We carefully hand-pick each of our fabrics to ensure you get the highest quality and most durable tablet stand you’ll ever find, as well as choosing on trend fabrics to compliment decor or individual taste. HOW DOES THE IBEANI DIFFER FROM OTHER IPAD, TABLET AND EREADER STANDS? Handmade in the UK: Unlike most competitors, all of our iBeani tablet cushions are manufactured in the heart of England, UK, meaning we support local/British supply and manufacture. Use your iBeani tablet stand anywhere: Designed to be used on your lap, on the sofa, in bed, at a desk, in the car or anywhere. Unlike other tablet stands which require a hard, level surface, the iBeani can be used wherever you need to use your tablet. Change the viewing angle: Depending on where you are or how you are sat (or slumped), you may need you tablet to be angled differently. With the iBeani you can easily change the viewing angle to suit your requirements. Works with all devices: The iBeani tablet bean bag will work with all known tablet devices on the market, any size, portrait or landscape, with or without a case. Comfortable: Whether resting on your lap or at a desk, the iBeani tablet stand is adaptable to ensure you have a comfortable experience, with as little strain as possible. Helping combat RSI (Repetitive Strain Injury) type problems, and in our opinion helps with posture. Social: The iBeani allows you to get the perfect angle to prop-up your tablet so you can share photos, videos, music or anything with friends and family. It is also perfect for using with Skype or other video chat services too. Simply put your tablet on your iBeani tablet bean bag stand, get the best angle for your camera, then chat away. Multi-use: The iBeani isn’t just a tablet stand – It has many additional uses! Use it as a book stand for the kitchen or office, a steady camera mount when videoing or using long-exposures, or even use it as a handy travel pillow. Lightweight: An iBeani tablet stand weighs approx 225grams, so ultra-lightweight, but with the combination of great design and the optimum fill level, it will happily take the weight of your tablet device and hold it securely for you. On-trend designs: We carefully select fabric designs, or create our own, to compliment decor or other soft furnishings in your home, making iBeani the must have life style accessory. It will sit proudly in any room of the home, with no need to tidy it away, ready to be used next time you use your tablet. If you have any further queries then feel free to pop into our shop to examine them for yourself before you make up your mind or you can contact us first and we’ll be more than happy to help answer your questions.